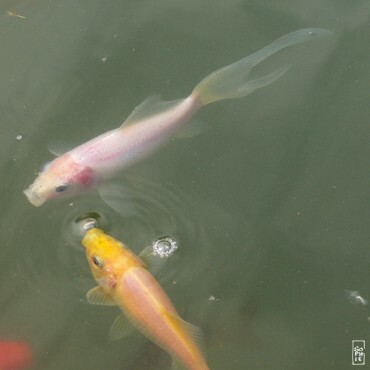 The first inhabitants of the pond were 5 red goldfishes and 3 shubunkins, including a white one. 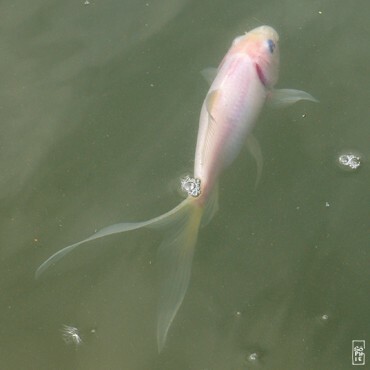 There are now several white shubunkins, and the long caudal fin seem to be an easily passed-on characteristics, so that some red goldfishes now have them. Recently, some goldfishes look more yellow than red. Les premiers habitants du bassin furent 5 poissons rouges et 3 shubunkins, dont un blanc. Il y a maintenant plusieurs shubunkins blancs, et la longue caudale semble être un trait qui se répand facilement, des poissons rouges en on maintenant une. Récemment, certains poissons sont plus jaunes que rouges.